AFRICAN AMERICAN REPORTS: Dawn Staley leads South Carolina women to NCAA women's basketball championship! 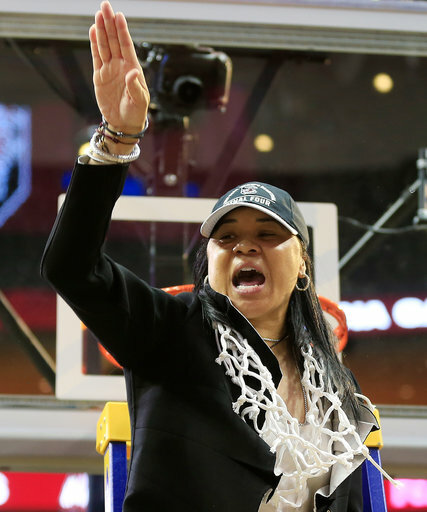 Dawn Staley leads South Carolina women to NCAA women's basketball championship! Dawn Staley didn't win an NCAA title as a player, although she went with Virginia to the Women's Final Four three times. She has finally won her college championship, as the coach of the South Carolina Gamecocks! She becomes the second black woman to coach a team to a women's championship. Carolyn Peck coached Purdue to a championship in 1999. For the first time in four years, women’s college basketball has a new top team and it wears garnet and black. The South Carolina women’s basketball team is the new national champion, winning a national title for the first time in program history. The Gamecocks beat Mississippi State 67-55 in Dallas on Sunday afternoon, completing the run through the postseason all the way to the crown in Dawn Staley’s ninth season. USC made the whole run without senior center Alaina Coates, who missed the NCAA Tournament with an ankle injury. But what the Gamecocks had was more than enough — and all of it is expected back next season. Junior forward A’ja Wilson led the Gamecocks with 23 points, while Allisha Gray — the star against Stanford on Friday in the Final Four — again came up huge for South Carolina with 18 points.